Utagawa Kuniyoshi (1797-1861) General Imafuku Zenkuro Katsutada from Twenty-four Generals of Eastern Kai Province, One by One, 1853. Oban. 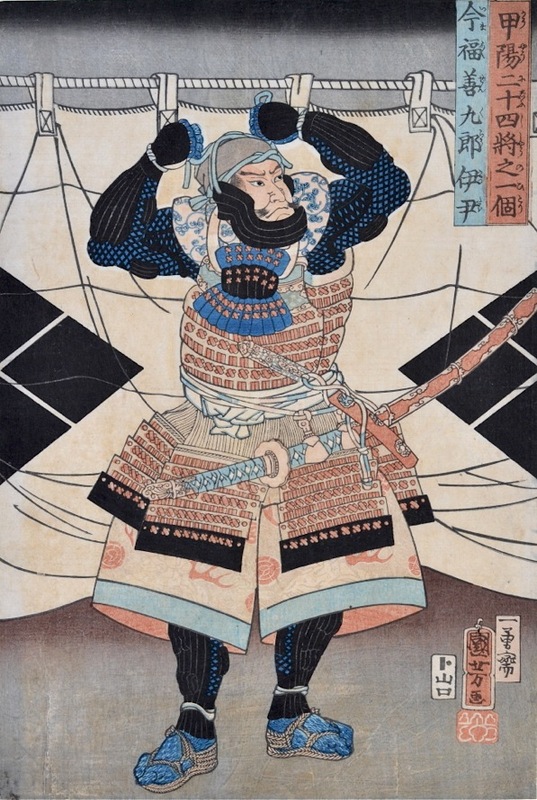 This is a fine Kuniyoshi military portrait from an excellent series of 1852. Takeda Shingen of Kai Province conquered Shinano Province in 1547, expelling Murakami Yoshiharu and Ogasawara Nagatoki, who turned to Uyesugi Kenshin of Echigo Province for help. A series of battles between the forces of Takeda Shingen and the forces of Uyesugi Kenshin were fought on the plain of Kawanakajima in the northern Shinano Province near the modern-day city of Nagano. The five major battles took place between 1553 and 1564. The exact number of prints in this series is unknown, There were twenty-four Generals in the campaign and Robinson lists five prints (not including this one) although ten are currently known. Kuniyoshi portrays Katsutada adjusting his face guard, (menpo) prior to battle. All the prints in the series have the running background of the white tent curtain bearing the Takeda mon. The title of the print is in the red cartouche and the name of the General alongside. The anomaly of the print is the absence of censor seals. The print is an early edition, sharing the same block flaw as the British Museum copy and it is possible that this was produced prior to approval by the authorities. It is a fine early impression, fine colour and very good condition. Backed onto album backing paper.